Browse: Home / 2019 / April / 13 / Vasiliy “Hi-Tech” Lomachenko & Gilberto “Zurdo” Ramirez Score KO’s! Top Rank’s Bob Arum brought the best P4P boxer in the world to the Staples Center, Los Angeles, CA, Friday, via the ESPN+ network for. In the Main Event the WBA Super World and WBO World Lightweight Champion Vasiliy “Hi-Tech” Lomachenko defended both titles against the former WBA lightweight champ Anthony “Million Dollar” Crolla, of Manchester, UK. 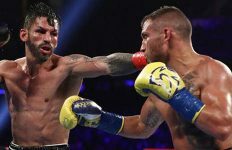 In the Main Event the two-time Olympic Gold Medalist WBA Super World and WBO World Lightweight champion southpaw Ukrainian Vasiliy “Hi-Tech” Lomachenko, 13-1 (10), of Oxnard, CA, destroyed former WBA Lightweight champion and current No. 1 WBA contender Anthony “Million Dollar” Crolla, 34-7-3 (13), of Manchester, UK, at 0:54 of the fourth round. In the first round Lomachenko was the aggressor for the most part. Both fighters have a recent past of injuries. Lomachenko ended the round with a right to the left ear of Crolla. Lomachenko coming off shoulder surgery. Crolla told he would never fight again after having a cracked skull being hit with a concrete block chasing intruders at his home. In the second round Lomchenko is moving well landing his jab. His body shots are hurting Crolla. Lomachenko hurt Crolla in the final minute with a crushing left to the body. Three lefts to the head hurt Crolla from Lomachenko. At the bell Lomachenko landed another good body shot. In the third round Lomachenko landed four punches to the head of Crolla. At the halfway part of the round Lomachenko landed a triple jab and a left uppercut to the chin. Lomachenko hurt Crolla again causing referee Jack Reis to give a standing 8 count misunderstood by Lomachenko thinking he won. Referee Reis had to chase two officials out of the ring as the bell sounded seconds later. In the fourth round Lomachenko received a cut outside of his left eye and with blood flowing down his face he landed a left lead and followed with a crushing right hook on the side of the head of Crolla knocking him face down bleeding from the nose and all but out cold. Referee Reis immediately stopped it. “I want to thank my daughter for helping me with my right shoulder. Thank you to the fans. I want to unify and fight Mikey Garcia,” said Lomachenko. In the co-feature WBO World Super Middleweight champion southpaw Gilberto “Zurdo” Ramirez, 40-0 (26), of Sinaloa, MEX, living in Hermosa, CA, impressed in a non-title light heavyweight fight stopping southpaw Tommy “Kryptonite” Karpency, 29-7-1 (18), of Adah, PA, at the end of 4 rounds. In the first round it was announced Ramirez on fight night came in at 196 pounds. Both southpaws are throwing punches well with no feeling out round. Karpency came into the ring with a bruise under his left eye sparring with his brother Jeremy. The best punch of the round was a left to the chin of Karpency by Ramirez. In the second round Karpency landed a solid right hook to the chin. Ramirez landed a 3-punch combination to the body. Karpency landed a flurry of punches. 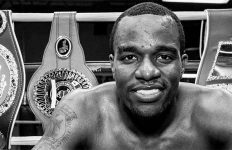 Karpency has fought for a world title but the many fans of Ramirez lets him know what he is up against traveling 3,000 miles across the country. In the third round Ramirez was landing twice as many punches than Karpency who is on the defense for the most part. Ramirez has dominated the fight up to this point. He’s looking to impress at the higher weight and is not disappointing. 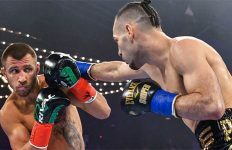 In the fourth round Ramirez worked the body and head putting many welts on the face of Karpency who was hurt by punches to the ribs on the right side. Between rounds he told his dad and trainer “my ribs are broke. I took a body shot in the first round that caused it”. 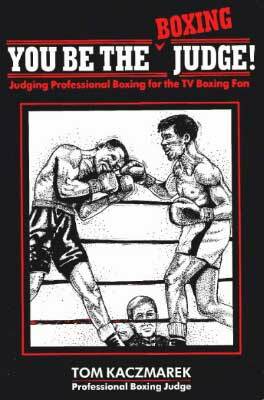 The fight was stopped by referee Ray Corona. “I want to stay at 175 where I feel the power here and am very comfortable. 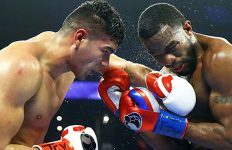 I want the other champs to prove to be the best,” said Ramirez. NABF Super Lightweight champion Arnold Barboza, Jr., 21-0 (8), of Los Angeles, CA, impressed easily stopping former interim WBO World Super Lightweight champion Mike “Mile High” Alvarado, 40-5 (28), at 0:49 of round 3. In the first round Barboza is landing 3-punch combinations to the body and head being the faster of the two. With hands held high blocking many punches thrown he is still able to out land the former but much older champion. In the second round Barboza landed a lead right to the chin followed by a left hook to the body. Alvarado landed a double left hook to the head. Barboza came back with a flurry of punches in bunches. Blocking body attempts from Alvarado Barbosa landed a right uppercut to the chin. In the third round Barbosa came out with a flurry landing a right uppercut after a left hook to the chin. A lead straight right to the chin followed by a left hook to the head knocked Alvarado down. Upon rising, he wobbled causing referee Thomas Taylor to wisely stop the fight. Welterweight southpaw Alexander Besputin, 13-0 (9), of RUS, living in Oxnard, CA, retained his USBA title defeating a game Alfredo “Alfri” Rodolfo Blanco, 20-8 (11), of Bueno Aires, ARG, over 10 rounds despite a cut suffered in the first round. In the first round Besputin received an accidental cut over his right eye. In the next three rounds Besputin showed more power but Blanco had a herky jerkey style going from orthodox to southpaw and back. Besputin landed a flurry of punches at the end of the fourth round mostly to the head of Blanco. In the fifth round Besputin kept the pressure on Blanco. Even his jabs seemed to do damage to the face of Blanco. In the sixth round Blanco, though taller, mostly fought out of a crouch. Referee Eddie Hernandez, Sr. warned Blanco of a low blow. With a minute left in the round Besputin was landing well as Blanco was moving along the ropes. Suddenly a borderline punch from Besputin seemed to spur Blanco on going on the offense before Besputin took over again. Referee Hernandez seemed to be observing Blanco carefully with the many punches he had taken. In the seventh round, Blanco came out swinging wild overhand punches but missing most of them. Besputin moved Blanco into a corner landing several punches to the head. In the final seconds Blanco went once again on the offense throwing and missing with wild punches. In the eighth round Blanco came out throwing punches and landing several before Besputin took over landing punches to the head of Blanco. A straight left from Besputin rocked Blanco. He followed up with over half a dozen jabs frustrating Blanco. Blanco moved away but got forced into a corner and got hit by half a dozen punches. Blanco landed several punches to the head re-opening the cut over Besputin’s eye and causing blood running down the side of his face. In the ninth round while landing punches Besputin came up with his head accidentally clashing heads with Blanco plus landing a left to the side of his head causing the referee to stop the action for about ten seconds. Besputin suffered a small cut on his forehead. He jumped on Blanco trying for the stoppage landing a rare body shot from a left hurting Blanco. In the tenth and final round Blanco landed an overhand left to the head and started trying to land a knockout knowing he is way behind on the score cards. Blanco landed a pair of right hands to the body. Besputin anded a flurry of punches to the head. Then ended the round with three left’s to the head of Blanco who showed a lot of courage to go the distance. Scoring was 100-90 twice and 99-91 with this writer having it 100-90. Middleweight southpaw Janibek Alimkhanuly, 6-0 (2), of KAZ, and Oxnard, CA, was quite impressive in defeating a game Cristian “Ruso” Olivas, 16-5 (13), of MEX and San Diego, CA, over 10 rounds to take vacant Continental Americas title. In the first round Olivas was the aggressor but took a steady bunch of jabs with his face being reddened already by Alimkhanuly. Olivas lone non-jab was a left hook to the chin of Alimkhanuly turning away. In the second round Alimkhanuly kept up using his hab and a right uppercut to the chin. He has very good movement with a good amateur career already going into a ten rounder in only his sixth fight. In the final minute Alimkhanuly landed a solid lead left to the chin. In the third round Alimkhanuly stayed in the middle of the ring exchanging uppercuts with Olivas getting the better of it. He worked the body of Olivas in the first half of the round. In the final lminute Alimkhanuly started moving around the ring again. He was warned for a low blow by referee Ray Corena in the final thirty seconds of the round. He ended the round with several solid combinations to the head. In the fourth round Alimkhanuly landed almost every punch he threw in the first half of the round. Olivas was ducking into several left uppercuts on the chin. In the final seconds Alimkhanuly rocked Olivas with a right hook on the chin. In the fifth round Olivas walked into a left uppercut after the first minute of the round. Olivas was chasing but taking too many punches from Alimkhanuly continuously. In the sixth round Alimkhanuly landed a 3-punch combination at the halfway point to the head of Olivas. He has also worked the body more this round being encourged to do so by his trainer Buddy McGirt. Alimkhaunuly ended the round with three jabs and a left to the head. In the seventh round Alimkhaunuly landed to the head well to a gutsy Olivas who was obviously in with someone with superior skills. In the final minute Alimkhaunuly with his right to his side the entire fight comes up with a steady amount of jabs. He ended the round round with a pair of straight left’s to the chin. In the eighth round Olivas came out landing a double left hook to the chin before Alikhaunuly returned punches. The lopsided fight continued with Olivas walking to a neutral corner at the end. In the ninth round Olivas was getting more punches than usual in on Alikhaunuly while inside. Alikhaunuly seems to be smiling knowing he has the fight in hand throughout most of the second half of the fight. In the final minute there was an accidental clash of heads. In the tenth and final round with Olivas knowing he needs a knockout to win is throwing wild punches with most missing. Alikhaunuly is using more hand speed inside with landing flurry of punches. Scores were 99-91 and 100-90 twice as did this writer have it. Heavyweight Guido “The Gladiator” Vianello, 3-0 (3), of Roma, IT, stopped “Bullet Proof” Lawrence Gabriel, 3-2-1 (2), of Syracuse, NY, at 0:49 of the first round. In the first round Gabriel used a good jab trying to keep an aggressive Vianello until a right to the chin hurt Gabriel badly following with a flurry of punches to the head driving him to the canvas. Upon rising referee Thomas Taylor wisely stopped the fight. 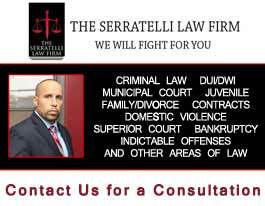 Gabriel was returning to the ring after a ten month layoff due to being shot four times. Super Lightweight Jose “Ruben Rodrigues” Rodriguez, 6-0 (2), of Indio, CA, defeated Ramel Snegur, 3-4-1 (2), Portland, ORE, by majority decision over a spirited four rounds. In the first round the taller Snegur used his reach but got caught with several rights to the chin. In the final minute Rodriguez suffered a bloody nose. In the second round both landed left hooks to the chin at the same time. Snegur threw a right but got countered with a lead right followed by a left hook to the chin rocking Snegur. Seconds later a left hook from Rodriguez rocked Sneggur. He followed up near the end of the round rocking Snegur with another left hook to the head driving him back several steps. In the third round a double jab followed by a right to the chin from Rodriguez. Snegur kept moving straight back getting hit by Rodriguez. Rodriguez out jabbed Snegur though the shorter of the two. In the final seconds Snegur landed the final two punches. In the fourth round Snegur seemed to walk into punches standing straight up. Rodriguez was landing quite a few left hooks to the chin. A left uppercut to the chin in the final minute knocked the head of Snegur back. Scores were Russell with a strange 38-38, Villarreal 39-37 and Barragan 40-36 as did this writer have it. The referee was Sharon Sands. There was an unusual delay for over 20 minutes on ESPN+ before the co-feature. This network does not work as good as the Zone for they just shut off stating “this program has ended”.